Background In motor neurone disease (MND), respiratory muscle weakness causes substantial morbidity, and death is usually due to respiratory failure. Non-invasive ventilation (NIV) improves symptoms, quality of life and survival, but previous surveys showed that few patients with MND received NIV. Methods A postal survey was conducted of the clinical application of NIV in MND among consultant neurologists in the UK. The results were compared with those of a similar survey done in 2000. Findings Over 12 months, 612 patients were referred for NIV of whom 444 were successfully established on treatment (72.5% success rate). 38% of responding neurologists assessed respiratory function at presentation and 20% routinely monitored respiratory function; 32% relied on symptoms as the only criterion for NIV referral and 43% used a combination of symptoms and physiological impairment. 75% of responding neurologists accessed specialist palliative care services for their patients towards the end of life and 69% at an earlier stage. Interpretation Compared with 2000, there has been a marked increase in the number of patients referred for, and currently using, NIV (2.6 and 3.4-fold, respectively). The proportion successfully established on NIV has also increased, suggesting more appropriate selection and/or improvement in the methods of using NIV in this challenging group of patients. However, monitoring of respiratory function is suboptimal and uncontrolled oxygen is sometimes used inappropriately before the terminal phase. In view of this and other evidence that NIV improves survival7–14 and QoL7 8 14–16 in MND, we performed a second and more detailed survey to assess whether there has been a substantial change in UK clinical practice since 2000. In April 2009, a questionnaire was sent to all consultant neurologists in the UK, identified through the Association of British Neurologists; those surveyed included the three neurologists among the authors. A second mailing was sent to non-responders 8 weeks later. A reply card was enclosed to identify clinicians for whom the questionnaire was inapplicable (eg, retired, allied neurological specialists or clinicians who did not see patients with MND). The questionnaire was an expanded version of that used in our earlier survey (see appendix available online only). We assessed monitoring of respiratory function, criteria for initiating NIV and barriers to its use in greater detail and added a section on the use of other palliative therapies for respiratory symptoms and referral to specialist palliative care services. Of 620 consultant neurologists identified, questionnaires were sent to 618 (two addresses not provided); 388 (62.8%) responded, including 166 completed questionnaires and 222 reply cards. The total number of new patients with MND seen in the preceding 12 months was 1695, with a median (range) of 4 (0–100) per neurologist. There were 3077 patients under review with a median (range) of 5 (0–200) per neurologist. The median frequency of review was 3 monthly (range 1–12 months). The proportions of responding neurologists who assessed respiratory muscle function at presentation, routinely at every clinic visit or only if the patient is symptomatic, are summarised in table 1. Of note, only 38% performed any respiratory function test at presentation and fewer routinely monitored respiratory function during follow-up visits. Forty-six per cent performed tests only if patients were symptomatic. Of the responding neurologists who assessed respiratory function, the most commonly used test was spirometry performed sitting, followed by supine spirometry. Respiratory pressures (sniff nasal inspiratory pressure (SNIP), maximum inspiratory (Pimax) or expiratory pressures) were measured infrequently. Thirty-two per cent used pulse oximetry either routinely or if the patient was symptomatic, and most of these neurologists also performed arterial blood gas analysis if indicated. Of patients with sleep related symptoms, 62% of responding neurologists reported referring at least some for nocturnal oximetry, 17% used nocturnal transcutaneous PCO2 (eg, TOSCA), 18% respiratory sleep studies and 6% polysomnography. Overall, 67% of responding neurologists used nocturnal studies to assess sleep disordered breathing and gas exchange. Seventy-seven per cent of responding neurologists used selection criteria for NIV: 32% relied on symptoms only, 43% used a combination of symptoms and physiological impairment and 10% used early intervention, defined as patients with physiological impairment but minimal or no symptoms (table 2). The specific symptoms most likely to trigger referral were morning headache, daytime sleepiness and orthopnoea. Of neurologists who included physiological assessment, only 32% stated thresholds for referral: these were, variously, median vital capacity = 50% predicted, Pimax = 40% predicted or 40 cmH2O, and SNIP = 35% predicted or 40 cmH2O. Only 1% of responding neurologists indicated they had no access to NIV services (10.2% in 2000), 44% had a local and 55% a regional service. There were few reported barriers to NIV use: no local service (9%), insufficient machines (6%), service constraints hindering routine monitoring of respiratory function (5%), no established referral criteria (4%) and other reasons (3%). Over the preceding 12 months, 612 patients were referred for NIV (range per neurologist 0–50). Of these, 444 were successfully established on treatment (72.5% success rate). After adjusting for patients whose care was shared with another neurologist, 431 were currently receiving NIV. Other specialities involved in referral of patients for NIV included respiratory (29%), palliative care (10%) and anaesthetics (2%). Only 23% of responding neurologists confirmed that their NIV service had full 24 h technical backup and 29% had continuous clinical backup. The total number of new patients seen in 2009 was very similar to 2000 (figure 1, table 3). However, the proportion referred for NIV had increased markedly (2.6-fold), as also had the total number currently being treated with NIV (3.4-fold increase). The number of responding neurologists who reported seeing new patients with MND had declined, while the number making five or more referrals per year had increased. Nevertheless, considerable heterogeneity remained, with seven neurologists responsible for more than one-third of referrals nationally and three of these making 20% of the total. Non-invasive ventilation (NIV) referral pattern. Few patients were receiving long term tracheostomy ventilation (TV) and this had often been initiated as an emergency (good bulbar function: elective TV = 4, emergency TV = 9; severe bulbar impairment: elective TV = 6, emergency TV = 7). The diagnosis had been unclear at the time of emergency tracheostomy in seven of 16 patients. The most common deterrent to referral for NIV was cognitive impairment, followed by social isolation, rapidly progressive disease and severe bulbar impairment (figure 2). Deterrents to referral for non-invasive ventilation (NIV). Responding neurologists were more likely to consider NIV in patients without severe bulbar impairment (table 4). However, very few considered that there was no role for NIV, even in patients with severe bulbar impairment. We compared the practice of the seven highest referring neurologists to that of the others. As expected, the practices of the frequent referrers were larger (mean new patients/year = 50.6 vs 8.4). In addition, they monitored respiratory function more frequently and were more likely to consider early intervention with NIV (table 5). We also assessed whether differences in practice were related to clinic size. The responding neurologists' responses were ranked in quartiles according to the number of new patients seen (see online table). Compared with the previous survey, there were similar increases in the numbers of patients referred for NIV across all quartiles. However, the success rate in patients referred by neurologists in the lowest quartile of practice size (quartile 1) was less than that from neurologists in the highest quartile (quartile 4). Neurologists with the smallest practice were also less likely to assess respiratory muscle function and less likely to rely on the combination of symptoms and physiological impairment or to consider early intervention. At the end of life, 75% of responding neurologists accessed specialist palliative care services and a similar proportion (69%) reported referral at earlier stages of the disease. Palliative measures used by responding neurologists for symptomatic patients at different stages of disease are shown in table 6. At the end of life, the most commonly used medication was opioids. Benzodiazepines and oxygen were also used in almost half of patients. Prior to the terminal phase, oxygen, opioids and benzodiazepines were used for symptomatic patients in whom NIV was inappropriate or not tolerated. In symptomatic patients prior to the end of life who had not yet had an NIV trial, pharmacological agents were prescribed less commonly, although oxygen was used in such patients by 26% of responding neurologists. We have performed a comprehensive and detailed survey of the current practice (2009) of clinical neurologists in the UK in relation to the use of NIV in patients with MND. Clearly, such a study has important limitations. Replies were received from only 63% of practising neurologists and we have no information on the number of patients managed by the non-responders. However, the number is likely to be small as the total of 1695 new patients diagnosed over 12 months is similar to our earlier survey (table 3) and the estimated incidence of 2.76/100 000 is close to that expected from previous studies.1 6 It was not possible to verify the accuracy of the replies as the survey results were anonymous. We also acknowledge the potential for varying interpretation of the questions by respondents, notably questions pertaining to ‘end of life’. However, this term is now widely used to describe the terminal phase of an illness, when management becomes purely symptomatic and palliative; also, the questionnaire was reviewed by neurology, respiratory and palliative care physicians to ensure face validity across domains. The survey was restricted to the views and practice of UK neurologists. Over 9 years the population of active neurologists will have changed appreciably and we are unable to judge the extent to which changing attitudes reflect the views of the same individuals or those of more recently appointed specialists. The views of patients and their carers, while of great importance, were beyond the scope of the study. We investigated how the skewed distribution of referral rates might have influenced the conclusions: as expected, neurologists referring the highest numbers of patients for NIV also had the largest MND practices. However, the ratio of the number of patients referred for NIV to new patients was similar across all quartiles and, indeed, the quartile with the least number of MND patients showed the largest proportional increase in referrals compared with 2000. Larger centres used respiratory function more frequently and were more likely to use both a combination of physiological impairment and symptoms and early intervention for NIV referral. Furthermore, a higher proportion of their patients were successfully established on NIV, which may reflect more appropriate selection. Only a small proportion of responding neurologists assessed respiratory function at presentation and fewer monitored respiratory function routinely. Reliance on symptoms alone, however, is not a sensitive way of recognising significant respiratory muscle weakness; breathlessness may not be apparent until weakness is severe, particularly when mobility is limited, and sleep related symptoms may be ascribed to the underlying condition. Consequently, the severity of respiratory impairment is easily underestimated clinically. In one study, of 45 patients with forced vital capacity <50% predicted, the attending neurologist had initially considered respiratory function to be normal in 29 and only mildly impaired in 15 patients.17 Furthermore, following the onset of orthopnoea or daytime hypercapnia, survival is likely to be only a few weeks or months.7 14 Regular monitoring of respiratory function informs the frequency of clinical review, facilitates earlier discussion with the patient about the option of NIV and reduces the risk of having to initiate NIV in an emergency. Compared with our earlier survey, there has been a 2.6-fold increase in the number of patients referred for NIV and a 3.4-fold increase in the number currently using NIV (table 3). Since the incidence of MND has remained stable over this period, this implies a substantial change in clinical practice, presumably in response to increasing evidence that NIV improves QoL and survival,7 14 at least in those with better bulbar function. Not only has the number of patients referred for NIV increased but the proportion successfully established on treatment has also improved This suggests that the patients being referred are now more appropriately selected and/or there has been an improvement in the application of NIV in this challenging group of patients. Access to NIV services appears to have improved, with the percentage of neurologists reporting no access falling from 10.2% to 1%. Although lack of a local NIV service was the most frequently cited barrier to its use, this may in part be due to the difficulty for patients with more advanced disease to undertake long journeys. As with many conditions which benefit from specialised care, there are advantages of focusing care on larger centres, in order to optimise the availability of facilities and the expertise of personnel. In this context, it is noteworthy that new patients were seen by 163 neurologists compared with 254 respondents in our earlier survey. Cognitive impairment followed by social isolation were the most commonly cited deterrents to NIV referral. Fronto-temporal dementia affects 5–10% of MND patients but lesser degrees of cognitive impairment are much more common.20 In such individuals communication problems may cause difficulty assessing capacity, obtaining valid consent to treatment and ensuring cooperation. The importance of social isolation as a deterrent to use of NIV may reflect the changing demographics of British society, with increasing numbers of people living alone.21 Compared with our earlier survey, fewer neurologists are now deterred by either rapid disease progression or poor limb function and the proportion who indicated that NIV should be considered only in carefully selected patients fell from 72% to 37%. Palliative care as a specialty was involved in 10% of all referrals of MND patients for NIV. There is scope to further strengthen the links between neurology, respiratory and palliative care services29 and to expand education and training in respiratory aspects of MND for healthcare professionals involved in the care of these patients. This survey shows evidence of a marked change in clinical practice in MND in the UK in the past 9 years, with a large increase in referrals for NIV. It also shows that the proportion of patients successfully established on NIV has increased However, of concern, respiratory muscle function is often not assessed, uncertainty about when to consider patients for NIV remains and uncontrolled oxygen is sometimes used inappropriately in patients in whom NIV has not yet been considered. Recently published guidelines on the use of NIV in MND30 should help to address some of these concerns and a further increase in the use of NIV in MND is likely.
. Natural history of amyotrophic lateral sclerosis in a database population. Validation of a scoring system and a model for survival prediction. Brain 1995;118:707–19.
. Amyotrophic lateral sclerosis: Part 1. Clinical features, pathology, and ethical issues in management. Ann Neurol 1985;18:271–80.
. Respiratory function vs sleep-disordered breathing as predictors of QOL in ALS. Neurology 2001;57:2040–4.
. Effects of alterations in pulmonary function and sleep variables on survival in patients with amyotrophic lateral sclerosis. Mayo Clin Proc 1991;66:686–94.
. Nutritional status is a prognostic factor for survival in ALS patients. Neurology 1999;53:1059–63.
. Non-invasive ventilation in motor neuron disease: Current UK practice. Amyotroph Lateral Scler Other Motor Neuron Disord 2002;3:145–9.
. Noninvasive ventilation in ALS: indications and effect on quality of life. Neurology 2003;61:171–7.
. Bipap improves survival and rate of pulmonary function decline in patients with ALS. J Neurol Sci 1999;164:82–8.
. Noninvasive positive-pressure ventilation in ALS: predictors of tolerance and survival. 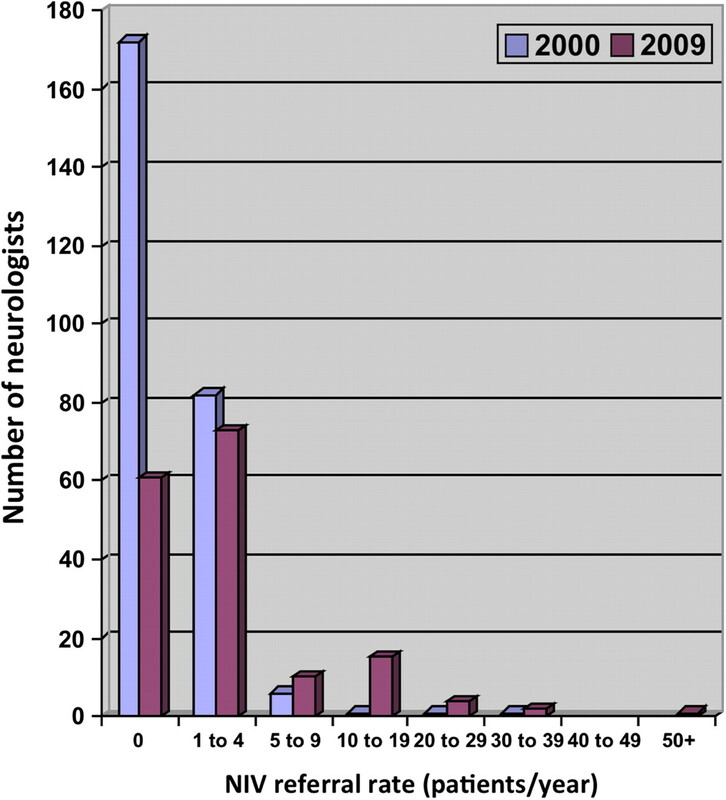 Neurology 2006;67:761–5.
. Survival in amyotrophic lateral sclerosis with home mechanical ventilation. Chest 2005;127:2132–8.
. Effect of noninvasive positive-pressure ventilation on survival in amyotrophic lateral sclerosis. Ann Intern Med 1997;127:450–3.
. Respiratory assistance with a non-invasive ventilator (Bipap) in MND/ALS patients: survival rates in a controlled trial. J Neurol Sci 1995;(129 Suppl):19–26.
. The effect of noninvasive ventilation on ALS patients and their caregivers. Neurology 2006;66:1211–17.
. A prospective study of quality of life in ALS patients treated with noninvasive ventilation. Neurology 2000;57:153–6.
. Objective measures of the efficacy of noninvasive positive-pressure ventilation in amyotrophic lateral sclerosis. Muscle Nerve 2001;24:403–9.
. Spirometry in amyotrophic lateral sclerosis. Arch Neurol 1979;36:74–80.
. Respiratory muscle strength and ventilatory failure in amyotrophic lateral sclerosis. Brain 2000;124:2000–13. General Lifestyle Survey (GLF). London: Office for National Statistics, 2008.
. Multidisciplinary ALS care improves quality of life in patients with ALS. Neurology 2005;65:1264–7.
. Outcome of ventilatory support for acute respiratory failure in motor neurone disease. J Neurol Neurosurg Psychiatry 2002;72:752–6.
. The course of the terminal phase in patients with amyotrophic lateral sclerosis. J Neurol 2001;248:612–16.
. Home care of patients with amyotrophic lateral sclerosis (ALS). J Neurol Sci 1997;152(Suppl 1):S82–9.
. Palliative care of patients with motor neurone disease. Prog Palliat Care 2007;15:285–93.
. Severe hypercapnia after low-flow oxygen therapy in patients with neuromuscular disease and diaphragmatic dysfunction. Mayo Clin Proc 1995;70:327–30. ; British Thoracic Society. BTS guideline for emergency oxygen use in adult patients. Thorax 2008;63(Suppl 6):vi1–68.
. Management guidelines for motor neurone disease patients on non-invasive ventilation at home. Palliat Med 2006;20:69–79. National Institute for Health and Clinical Excellence. Motor neurone disease—non-invasive ventilation. London: (CG105) National Institute for Health and Clinical Excellence, 2010. Funding Motor Neuron Disease Association. Ethics approval Confirmation was received from the Newcastle and North Tyneside 1 Research Ethics Committee.